Clicking on the cover will take you to its Amazon page. This is the most wonderful story – almost the book I’d like to have written myself, if I’d actually got round to doing it rather than just talking about it! Set in France, this children’s story (with an age band of 9-12, though I feel it can be read by younger and grown-up readers) has seven-year-old Molly as its main protagonist. Her family has just moved to France and everything is a bit new and strange. She discovers her resident tooth mouse (there are no tooth fairies in France) and a magical friendship begins. The author takes us into a world most of us would never have imagined existed, but the story is gritty and realistic too. There are also some wonderful and useful snippets about life in France and in particular the French language – funny and useful in equal measure for the Francophiles among us. Some of the chapters have short explanations at their start to introduce you to French sayings which will come in useful as you read on. McNab has captured wonderfully well the child’s perspective – the book is written in the first person so the story comes to us through the eyes of Molly. It is not a very well known fact but in France, there are no tooth fairies. Instead when you put your tooth under your pillow a little mouse, the tooth mouse, takes your tooth away. Originally just available on Kindle as an ebook, it’s now also available in paperback. As it’s a chapter book without pictures, the ebook is a good option unless you like to read a solid book. The link to Amazon is here. As a technical aside, I have the ebook version and there are a few pages where the font is, inexplicably, in yellow which makes it very difficult to read. These things happen when editing and converting into ebook form. But this is easily remedied by simply highlighting that section as you read it, or you could play around with font options. Inside the shoebox was a row of nine tiny beds, all beautifully made out of wood, each with a blanket and a tiny pillow. The pillows had been embroidered with an initial in the tiniest sewing and the bedcovers had been thrown back as if the mice had all jumped out of bed when we disturbed them. I have not done this book justice with my review and may well write about it in more detail at a later date. I wish more people knew about this book, and I hope Shelagh McNab has some more up her sleeve, as I’d certainly love to read more. I’m going out on what may appear to be a bit of a limb for this blog. It isn’t in fact a limb at all, as I adore children’s books and continue to enjoy them with my young family. In fact, I’ve never really stopped enjoying children’s books as I continued to read them as an adult before becoming a parent, and what better excuse than studying children’s literature for three years! Then it wasn’t that long until I had children of my own. I was planning to focus my blog on themes of the books I was working predominantly on (which was, at the time, horticultural books), but have decided to broaden this to encompass any and all the books I enjoy, focusing particularly on travel memoirs and children’s books, but on anything that takes my fancy, including editorial and self-publishing topics. Anyway, having visited our local library yesterday, what should we come home with, among many other volumes, but the aforementioned Snatchabook and The Bad Trousers by Ros Asquith, illustrated by Mairi Hedderwick (whose Katie Morag books we love), and more of this wonderful book later. And now I have a problem. When I really like a book, I have to own it, and both of these books have called out to me. The Snatchabook enticed me in straight away with the first illustration of Eliza Brown in her cosy bedroom. I may be a grown-up human, not a girl rabbit, but I wanted that to be my lovely room, with its bed tucked into a cosy nook, bookshelves carved out of the earth and a carrot-patterned lampshade casting a soft orange light over everything. The wind might have been whistling outside and whipping up the leaves, but in there it was cosy and warm. What follows is a wonderful story, whose message seems to be that everyone has the right to have a bedtime story. Its beautiful and humorous illustrations – as with all good picture books – showed you more than the words, and so extended the story, and the text with its sound, not contrived, rhymes, drew you through the action and lulled you to sleep in the end. We have already read it several times. And now to The Bad Trousers (nothing like Wallace & Grommit’s Wrong Trousers, I hasten to add), which was also a revelation. 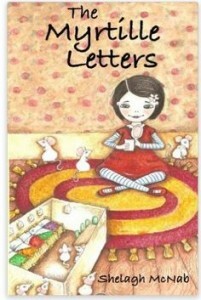 Part of the Little Gems collection published by Barrington Stoke, an Edinburgh publisher, the book has dyslexia-friendly features including being on cream, not white, paper, and having a lot of space around the words. But these features aside, it is a wonderful book. Mairi Hedderwick’s drawings are recognisable as those of Katie Morag’s creator, but somehow different. Because they aren’t the huge double-spread tableaus of the island tales, they appear more focused and detailed. Perhaps it’s just because the reader has less to look at on each page. It’s in chapter book form, but a mini version, measuring 14 by 16 cm. This gives it a lovely feel – substantial with over 80 pages, but small, which young readers will appreciate. It’s a sweet tale of Robbie, who’s counting the days until his birthday, and all the daily comings and goings in a small Scottish village. 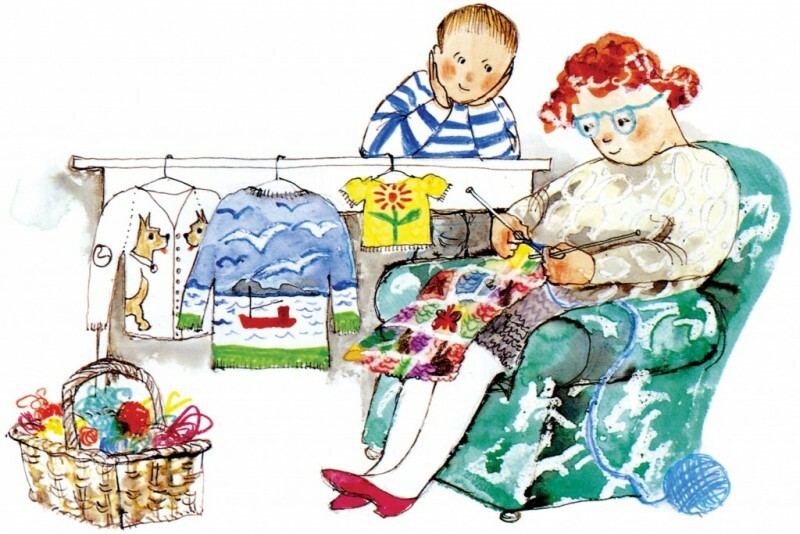 The character was actually created by Mairi Hedderwick (with the illlustrations dating from the early 1990s) and Ros Asquith has written a charming tale, full of quirky names and characters. Another one to read again and again. I will have to investigate more Little Gems. The visual and physical aspect of books, and perhaps in particular in children’s books, is a very important part of the reading experience. While I’m a big fan of the ebook, and believe there’s a lot of work to be done to produce more and better children’s ebooks, I can see that it is harder to adapt them for this medium. I’m going to enjoy owning these two very appealing books in paper form, once we’ve taken these borrowed ones back to the library. The Bad Trousers, by Ros Asquith, illustrations by Mairi Hedderwick. 2014/1993-1994. Edinburgh: Barrington Stoke. The Snatchabook, by Helen Docherty and Thomas Docherty. 2013. London: Alison Green Books/Scholastic. French Dirt – The Story of a Garden in the South of France was written by its American author, Richard Goodman, after he spent a year in a village in Southern France. Here he borrowed a plot of land and grew vegetables. He was a gardening novice when he set out and I’d be interested to know if he continued to garden after he returned to the United States. If you want to read an interesting book about creating and nurturing a vegetable garden from scratch while in a foreign country, then this may be the book for you. If you want to know more than the barest outline about his life apart from the garden and interactions relevant to it then you will be frustrated. French Dirt is a very focused, pared-down story which chooses not to tell us a great deal more about its author’s life. That was the author’s decision and it does work. This means it’s not a stereotypical book about moving to France, both because of its pared-down nature and because Goodman is not settling there. He is only visiting for a year so this in itself gives the book a very defined boundary. Despite, or perhaps because of, this single-mindedness within the book, it has a clean, unfussy style. Of course a year isn’t really long enough to learn about gardening and this is frustrating for the reader, as his successes are small while still giving him great satisfaction. However, Goodman used gardening as his means of getting to know the community he lived in, which was quite closed to a newcomer, especially a foreigner, as you’d expect. And the pleasure and satisfaction Goodman derives from gardening is described on a sublime level. It comes across as being an intense and life-changing experience. French Dirt raised some interesting language issues. Those that particularly struck me related to American English and the way words translate from French to English. The title French Dirt bothers me a little. It’s just a niggle. Americans use the word “dirt” in a much more expansive way than in British English. For example, I wouldn’t say “I knelt down in the dirt …” but an American would quite happily say this. I would be more likely to say “in the earth” or “on the ground”. Before I read it, I thought perhaps it was a bit of wordplay, for example, about gardening but also “dishing the dirt” on French village life. But not much dirt, if any, was dished. In fact, the author was very interested in his neighbours and their way of life. Far be it from me to suggest an alternative title though! There were other issues that may be of interest to seasoned gardeners. The author was always being advised to “grate” the earth. The French word was “gratter”. This was necessary so that the water could seep through clayey soil to the roots: “If I didn’t, the sun would turn the ground into a serving plate.” The author would “grate” the earth by working it with a hand shovel, turning it over. Is “grating” really the right word? It gave me a mental picture of someone slapping clods of soil against the side of a cheese grater; an odd, messy and senseless task. I’ve looked up “gratter” today in a French-English dictionary and found “scrape, scratch”. 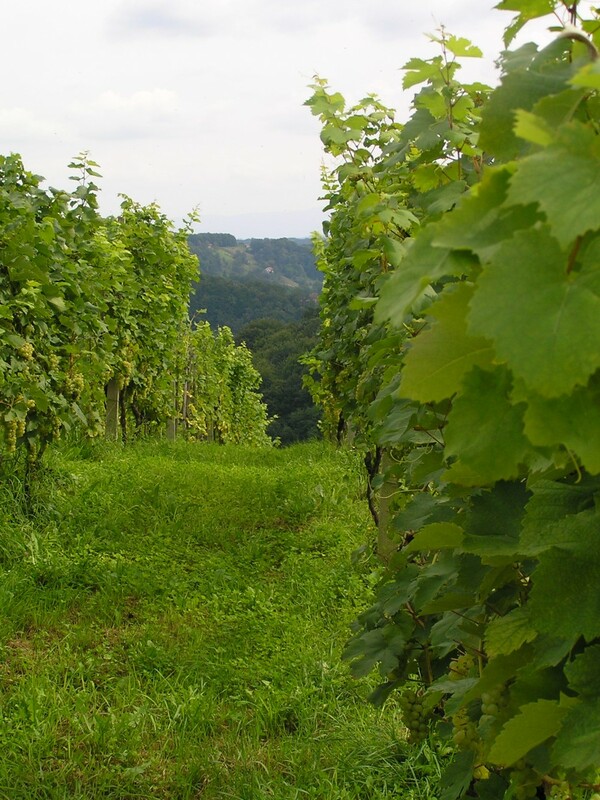 The author contributed to some village tasks, such as pruning the vineplants. The word for the job he did was “epamprer” which his dictionary defined simply as “to prune”. However, what he did was much more specific: the lopping off, by hand, of small leaves and branches from the trunks of the plants. He seemed to suggest that a more precise word was needed. My ancient French-English dictionary defines it as “to strip off leaves”. I suppose a general language dictionary may not be very specific about horticultural terms, but it makes me wonder if there is such a thing as a gardening dictionary to describe in detail what gardening terms mean. These are concepts taught by word of mouth, more often than not. None of these points are intended as a criticism of the book; they merely added to its interest. I suppose they were things that jumped out at me as someone who speaks a bit of French, knows a little about gardening, and is interested in words. As an editor I may have suggested a change to the translation of “gratter”. As a proofreader I may have queried it, sensitively. The book is written in American English so French Dirt is an appropriate title. You can see why American films sometimes have different titles for a British market, though. As the title of a film it would probably not work for this story! One final thing: this book has the most beautiful cover. You can see for yourself by clicking on the link below. Goodman, Richard (1992) French Dirt – The Story of a Garden in the South of France, Pavilion Books. I have recently been on holiday in France, a place anyone who knows me at all well will know is a favourite destination. I try to visit at least once a year, and would happily visit more. Anyway, I digress. Towards the end of our holiday my eye was caught by some Sweet Williams (Dianthus barbatus) in a bucket at a flower stall. Although I never buy them as cut flowers, they often catch my eye with their deep pinks, reds and purples, and their sheer posy-ish appeal. My eyes lingered only momentarily over the flowers, but as we moved off, my eye was really caught by something. Unsurprisingly, the label in the bucket didn’t say “Sweet Williams” – but what it did say was “Jalousie” (it may have been “Jalousies” but I didn’t take in the detail of it). That was strange and interesting, I thought. At the time, my errant brain meandered off on a different “Jalousie” course. I remembered a book I had (attempted to) read in secondary school French lessons, in which Venetian blinds and jealousy were interlinked. If I understood it correctly (which wasn’t a given, I hasten to add) the blinds were used as a metaphor for jealousy. In case you don’t know, the word for a Venetian blind and jealousy in French is the same. The book was La Jalousie by Alain Robbe-Grillet, which I must revisit one day (once my French has improved). Thinking back on it several weeks later, I wondered if I had imagined the “Jalousie” label, but when I looked the word up in my English-French-English dictionary, sure enough, one of the English equivalents was “sweet-william”. I then looked up the flower name in the English section, but instead of finding “jalousie”, the entry read “oeillet de poète”. 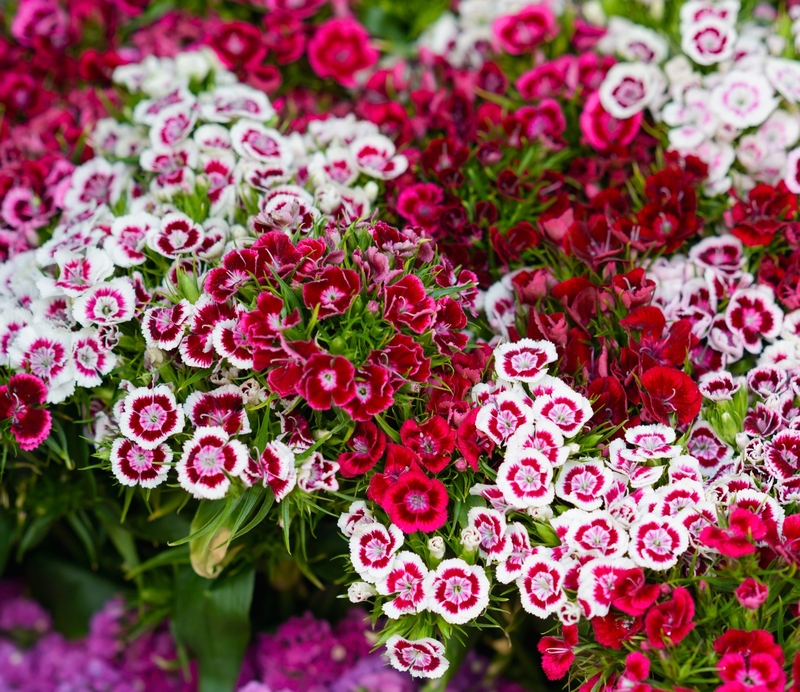 Yes, another name for the Sweet William is “little eye of the poet”. An oeillet on its own is an eyelet and a pink/carnation*, but when it’s the poet’s, it’s a Sweet William! Something to do with its prettiness being inspirational, I imagine? Their markings do also resemble a little eye blinking at you. Not that long ago I read The Language of Flowers by Vanessa Diffenbaugh, which I enjoyed immensely (more of that another time). This book really heightened my awareness of the meaning of flowers, which few of us think about when making a floral purchase. But I wondered if Sweet Williams were called “Jalousies” in France because of their meaning in flower language. I will have to look through Diffenbaugh’s book to see if they are mentioned there, but the source I have available today only gives “gallantry” as the meaning of Sweet Williams. So we have jealousy, gallantry, and poetry, all bound up in this sweet, pretty little flower, all of which fascinates this word nerd. It’s not beyond the realms of possibility that Sweet Williams have more than one meaning in flower language; Diffenbaugh’s book did demonstrate that flowers can have two quite diverse meanings. But if jealousy isn’t one of the meanings for Sweet Williams, somewhere there must exist an explanation for why the French call them “jealousies”. Perhaps this sort of jealousy doesn’t have the meaning we understand – after all, what is jealous about a blind? (Except as something a jealous one might safely peep through to make sure one’s loved one wasn’t misbehaving on the way to the doorstep?) I will try to find out, but in the meantime, I leave you with this thought: If you were a flower, wouldn’t you be a little jealous of the sweet Sweet Williams? *Dianthus caryophyllus. Carnations and Sweet Williams are, of course, both species of the Dianthus genus. "… the greater part of my spring happiness is due to the scent of the wet earth and young leaves." Should I be surprised that two of my favourite authors have yielded such satisfying horticultural quotes? It seems a fitting way to properly start my blog. Having grown up with very green-fingered relatives, and then having married someone of the same ilk, while I am not the leading gardener of the family, growing things – and, increasingly, growing them to eat – has always been a part of life. As a proofreader/editor, my main experience to date has focused on texts with a horticultural and environmental focus, and I have enjoyed every minute of working on them. I have found particular issues crop up when proofreading and editing this sort of work, and knowing a little about plant naming has helped, although there are plenty of reference books and websites that can shed further light. It occurred to me that others, whether writing about horticultural matters or editing them, might encounter similar problems. So I thought I would put them in my blog. It won’t all be instructional or advisory – some of it will be purely for fun and the enjoyment of sharing favourite plants and books. I will also write on more general themes inspired by my work, reading and life in general.